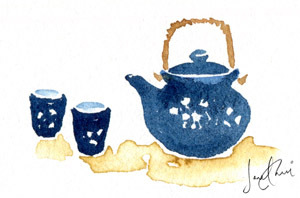 Chinese Tea: watercolour doodle, June 2014. Everything is a choice, including complacency, willful ignorance, and passive compliance. Thing is, these choices are presented over and over. If something keeps coming into one’s awareness (injustice, abuse, threat, etc) and one keeps choosing over and over to ignore it and ignore the suffering caused, make no mistake–that person bears responsibility for those choices made. Even breaking through conditioning is a series of choices, but they are choices that are present and available. Playing the ignorant victim is a continuous choice. Let’s get to the links, shall we? Laura Bruno: What’s Happening on 6/14/14? So much here. John Oliver Goes Off On An Epic, Fact-Checked, Mic-Dropping Rant For 13 Minutes That You Need To See Action is needed, especially if you live in the US. No One Applauds This Woman Because They’re Too Creeped Out At Themselves To Put Their Hands Together Again, choices. 13 Most Haunted Places in Singapore History and the Legends behind them This is my neck of the woods. There is a lot of trauma on this island, and I’ll tell my own stories and experiences in a future post. Chinese resort left looking like a tip after HALF A MILLION sun-seekers descend on it Warning: rage-inducing photos. Interesting that some comments try to point out “racism” and that there are other nationalities capable of this pollution, which I don’t doubt. But, such widespread disregard of the environment is a product of choice and education/culture. People can be taught to behave better, but if the education (or mis-education) is culture-specific, then change is hard in such pernicious systems. We can’t solve the problem if we don’t want to even recognise it. I don’t even want to admit to share genes with these people, and I abhore that those who contributed to this mess chose the selfish and destructive path.